The ultimate track driving experience, named after what many believe to be the best driver of all time, and road legal with it. Yes, McLaren has set itself a very tall task with its latest Ultimate Series car, the Senna. However, while we’re yet to test the Senna on the road, on the track it does indeed live up to all the hype that surrounds it, setting new standards for both its level of performance but also the intensity and involvement of the experience. It’s natural to be drawn to the Senna’s performance statistics, because any car that can reach 100kph from a standing start in just 2.8-secs tends to preoccupy the mind. Given it’s (dry) weight of 1,198kg, and the peak power output of 789bhp, it’s hardly surprising that the Seena possesses truly ferocious performance. But while the Senna is defined by some spectacular numbers – try 800kg of downforce at 250kph for starters – it’s the cornering speeds and braking performance that really stick in the memory long after the drive has ended. We struggle to think of another car that feels so at home on the track, and can brake with the same power and stability. Combine those attributes with a design that looks like nothing else – it looks much better ‘in the carbon’ than it ever does in photos – and it’s not hard to see why all 500 Sennas were sold out so quickly, despite the $993,200 price tag. With 659bhp/ton you won’t be surprised to hear that the Senna is fast. Just how fast is clearly betrayed by the numbers, with 100kph arriving in 2.8 seconds, 200kph in 6.8 seconds and 300kph after just 18.5 seconds, but in reality it doesn’t seem that much quicker than the already studiously rapid 720 S – perhaps additional performance becomes largely academic beyond a certain lofty point. In any case, the top speed is 340kph, but such matters were hardly McLaren’s focus with this car. There’s certainly a lot more noise and drama to the way it accelerates, thanks to the Senna’s minimalistic cabin, reduced soundproofing material and dorsal air intake, which really screams as the V8 is wound up to high rpms. 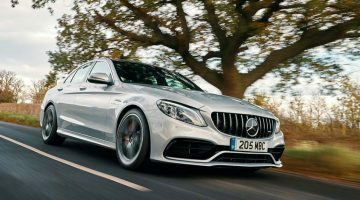 Nevertheless, the engine still sounds essentially the same as all the 3.8-litre and 4-litre McLaren V8s do – that is to say, hard-edged, aggressive, but not exactly melodic. 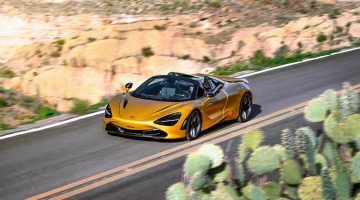 One new facet to its character is the vibration felt: McLaren have fitted more rigid engine mounts, and at certain revs the V8 sends a fizzing tremor down the driver’s spine. The M840TR version of McLaren’s V8 has been comprehensively revised over the engine in the 720 S for this, its most powerful iteration yet. Having passed through the roof-mounted snorkel intake, the ingested air then enters a new carbon fibre intake plenum that helps enable an even better throttle response. New cams and pistons, two instead of one fuel pumps and additional sensors ensure the V8 is capable of its increased outputs, which now stand at 789bhp at 7,250rpm and 590lb ft of torque from 5,500-6,700rpm. The spent gases leave via an inconel and titanium exhaust that exits on the top of the rear deck, with careful management of the airflow to ensure that it does not interrupt the workings of the rear wing. The exhaust is valved with the lower of the three pipes taking precedence at low revs and loads; in certain markets, this additional silencer and pipe is removed, whereupon there are just two pipes exiting in the exhaust surround. Like all other McLarens, the Senna uses a twin-clutch gearbox with manual control via paddles behind the steering wheel. In Sport mode the ignition is cut for the change of gear, but while it may seem impossible to get a quicker swapping of cogs, in Track and Race settings an ‘Inertia Push’ technology means there is virtually no interruption at all during the gear changing process. McLaren are at pains to stress that the Senna is compromised in terms of on-road refinement, to the benefit of its abilities on a track. After all, while it is full homologated for road use worldwide – something that sets it apart from numerous other track-specials in itself – it is still a track car first and foremost. The Senna uses the latest development of the firm’s hydraulically interconnected double wishbone suspension setup, with the emphasis on track ability. It’s called RaceActive Chassis Control 2, with many of the suspension parts fashioned from aluminium to save weight. It’s the adaptive dampers that are connected via the hydraulic system, and when Race mode is selected they not only stiffen considerably, but the ride height is also lowered. There are some very clever algorithms at work making sense of a mind boggling amount of technology. We’ll be driving the Senna on the public road in due course, and will then update this review accordingly. For how the Senna drives on a racing circuit, click on the ‘Track’ part of this review. There’s only one way to effectively drive a McLaren Senna on a circuit and that’s to take a deep breath, and then go for it. While the special esp settings for Race mode mean you can go up to and over the limit and still not trigger any electronic intervention, the whole car implores to be driven hard – and the brakes demand heavy use right from the off. Despite the obvious intimidation factor of driving such a powerful, valuable and extreme car, it’s very soon clear that the Senna is entirely on the driver’s side. Everything is does is so precise, so exact in its response to your inputs, that the bond between man and machine has formed almost before the end of the pit lane is reached. The steering is without fault: beautifully weighted, with wonderful feedback and unerring precision, it allows you to place the Senna exactly where you want it to go. The chassis responds in kind, and as a driver you soon have the confidence that it won’t do anything unexpected. This is down to a number of factors, of course, from the bespoke Pirelli Trofeo R tyres to the downforce being generated, and the single-minded focus of the overall package. It’s not merely that the Senna grips the road so hard, but that it also feels adjustable to the driver in an exploitable way – using the brakes on entry to a corner has the car rotating inwards in a beautifully progressive manner, yet there’s even progressive oversteer on offer once the rapport has been fostered. High speed corners require rather more bravery, simply because the speeds start to get very significant indeed, and if you’re used to purely mechanical grip then the Senna’s ability to cling on to its chosen line simply leaves the brain scrambled. It takes time to trust that the Senna will indeed stick to the road, but a curve taken flat at nearly 241kph is something to be savoured once you’ve built up to it. And yet in spite of how brilliant it is at accelerating and cornering, it’s how it stops that leaves the biggest impression. The Senna uses a special form of carbon ceramic brake, and this combined with the assistance of the rear wing means that the car stops in almost cartoon fashion. We’ve driven the car at Silverstone and Estoril circuits now, and the approach to the first corner at the latter required a sudden deceleration from 290kph to around 64kph, all of which could be achieved – after screwing up plenty of courage – in less than 200 metres. 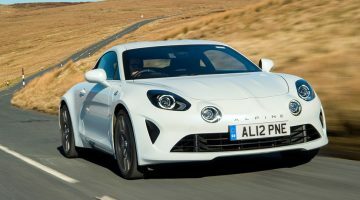 In such circumstances, the technique is simply to hit the brake pedal as hard as possible – itself totally unnatural at such high speed – and then feel your insides being compressed against the front of your rib cage. For a road car, it is simply otherworldly. It’s tempting to be pithy and simply leave this section with the words ‘thirsty and expensive’. It’s no surprise that the Senna will drink lots of fuel: when driven hard and using all of its 789bhp it’s clearly pumping in an awful lot of super unleaded. As for running costs, these will hardly be a consideration for the Senna buyer, although the fact that the car uses plenty of technology and componentry shared with other McLarens should pay some dividend when compared to other completely bespoke racing machinery. The Senna’s interior has been developed solely as an environment in which to drive quickly. In doing so, it takes the staples of the modern McLaren – the laid back, race car-style driving position, fabulous panoramic view and driver-centric control layout – and evolves them with a sharper focus on track ergonomics. Climbing in is hardly graceful, the driver needing to vault the sill and fit through the gap enabled by the butterfly doors. Once in, the embrace of the Senna’s special seat – weighing just 8kg – holds you tightly, a sensation amplified by the harness as you draw the belts down tight. In your lower peripheral vision the optional glazed door area reveals the road surface, about to rush by very quickly indeed; it could hardly be any more exciting. The door release mechanisms, window switches and engine start button have been moved to a panel above your head, while the slender infotainment display is joined by the rotating instrument binacle first seen on the 720 S.
Perhaps the most controversial aspect of the Senna is its exterior design, but much of how it looks has been dictated by form following function. The key to the whole setup is the active element of the aerodynamics: the front aero blades and that preposterous, enormous rear wing. The former bleeds off downforce if required to maintain handling balance, while the later also rotates (through 25 degrees in as little as 0.3 seconds) to aide braking performance. All over the Senna, from the front, the sides, underneath and on the rear deck, air is massaged, manipulated and squeezed for the benefit of both cooling and aerodynamic performance. Like all McLarens, the Senna is built around the firm’s carbon fibre monocage tub, here in its third evolution. It incorporates a double walled rear structure, thereby negating the need for a seperate roll over bar. Carbon fibre is used extensively throughout the car: the rear wing weighs under 5kg in spite of its size and the loads it must support; the weight of all the Senna’s body panels combined is only 60kg, with the front wing sections weighing just 0.6kg.